THIS COURSE BEGINS JANUARY 14 2019! 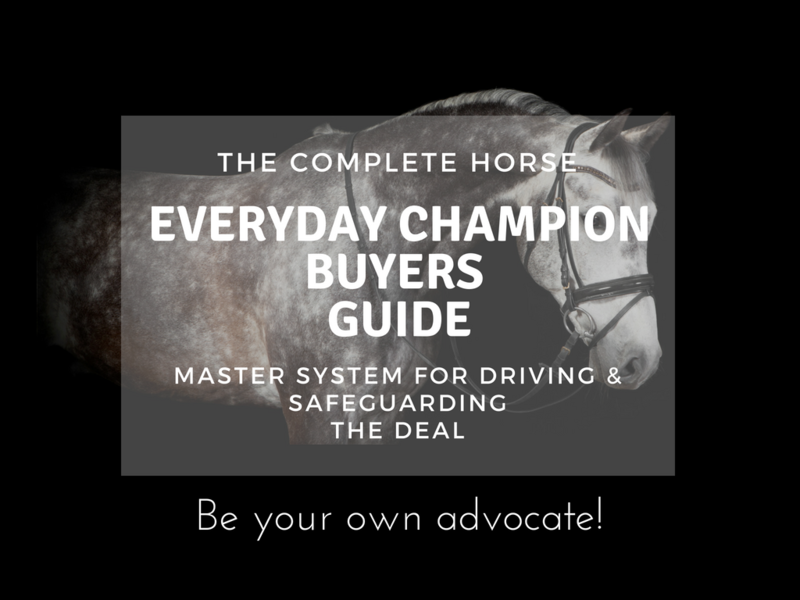 The Complete Horse official Guide to Purchasing a Horse "The Champion Buyer's Guide" Is what you have been looking for to put yourself in the drivers seat as your own advocate in the process of buying a horse - even if you aren't a horse expert. If you think you're ready to step into the horse life, or just really curious and want to know how to identify and purchase the right horse for you that is safe, sound, solid (and yes, dreamy), while smartly navigating the deal-making pitfalls the horse world is famous for, this course is absolutely for you! During this 6 week course you'll learn the exact formula Leslie uses for buying and importing investment horses such as Jumpers, Pure Spanish Horses, a USEF Horse of the Year (Catango V) Thoroughbreds, endurance horses, sport horses, ranch horses and beloved backyard ponies.. You’ll look over her shoulder as she walks you through how to be your own advocate, set up your own Super Net system, exact negotiation strategies, how to look critically at every horse to weigh greatness and weakness, the 3 fatal anatomy red flags, and how to know your field before you ever step into it. While there are indeed honorable sellers and dealers with right intention and solid integrity, appreciating them while employing a system that shines light on all parts of the deal to keep things honest will save you money, heartache and even safety. Whether this is your first run at buying a horse, and you’re looking for insight (and very good alternatives if it isn’t quite the right time) or if you are a seasoned veteran who would like to add to your own bag of tricks. This is the course for you. Week 2 - Where is your dream horse anyway? Week 4 - What The Heck is a PPE? Week 5 - Holster those dreamy eyes for battle, Captain! Based on the question "How do I navigate the costs of buying a horse when I have a budget of $8000, but have to travel to look at horses and Pre Purchase Exams cost $1000 each?" ...there are strategies and answers to that. A walk through of the exact system I use when evaluating every horse under consideration for purchase, from backyard pony to $500K European investment jumper. How I look at a sale horse critically and point out my 5 anatomy red flags. The three most common under-the-table deals between professionals involved in the purchase of your horse (even your own trainer! ), and my system to keep the deal on the table and the players relatively honest - without drama. The 10 most important questions to ask the seller (that tell you about the horse... and tell you about the seller) and the 3 requirements all horses must have before even being considered. How to use the EXACT negotiation strategies I use, and the number one greatest ace card I carry to move around typical hangups that railroad a deal. Limited enrollment is now open! We'd love to invite you to join us to learn more about this fantastic information that doesn't exist anywhere else!